The victim in a fatal shooting at a shopping center in Wildomar on Sunday has been identified as a Menifee man, and a Murrieta man has been arrested on suspicion of murder, police said today. Officers responding to a report of shots fired in the 32200 block of Clinton Keith Road at 3:23 p.m. found Mark Corona, 35, of Menifee dead in a vehicle. 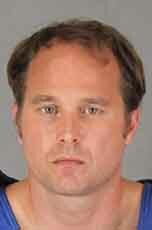 They detained Paul Stoeppler, 34, of Murrieta while securing the scene. After witnesses were interviewed, Stoeppler (below right) was arrested for murder and booked at the Cois Byrd Detention Center, according to a Sheriff's Department news release. No other details were released. Anyone with information is asked to call Investigator Argandona with the Lake Elsinore Sheriff Station at 951-245-3300 or Investigator Manjarrez with the Central Homicide Unit at 951-955-2777.